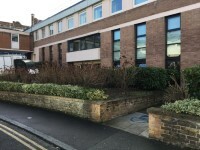 Related link Richard Hoggart Building. 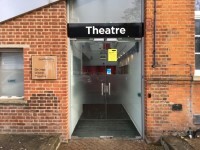 The theatre is located at the rear of the Richard Hoggart Building, off College Green. Goldsmiths is located in New Cross, South East London on Lewisham Road, five miles from central London. From Central London take the A2 towards Dover via the Old Kent Road. At the end of Old Kent Road (on the New Cross Gate one-way system) turn into New Cross Road. Keep in the right hand lane and shortly after Sainsbury's take the A20 fork to Lewisham. Turn right at the traffic lights into Lewisham Way – Goldsmiths is on the left. From Kent, Surrey, Sussex, or north if using Blackwall Tunnel or Dartford River Crossing (southbound). Follow the A2 or A20 towards London (using M25 or South Circular road to join the nearest of these). 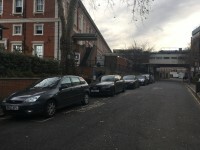 On the A20, after passing through Lewisham, the Richard Hoggart Building is clearly visible on the left after about one mile. On the A2, follow the left turn after New Cross Station into Amersham Road, turn right at the traffic lights into Lewisham Way – Goldsmiths is on the left downhill. 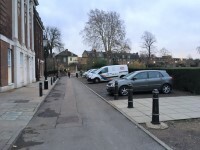 There is no public parking on the Goldsmiths campus. 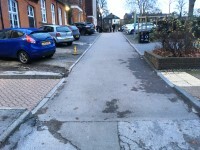 There are 2 on-street Blue Badge bays on Dixon Road, to the right of the Richard Hoggart Building, approximately 40m from the main entrance gate. The following buses stop outside Goldsmiths: 21, 36, 53, 136, 171, 172, 177, 225, 321, 343, 436 and 453. 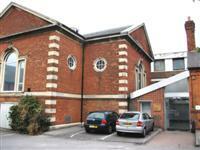 The nearest over ground station is New Cross rail Station and is approximately 5 minutes walk. New Cross Gate rail station is also within walking distance of Goldsmiths. There is not an underground station within walking distance of Goldsmiths. To see more information on Switchboard please click here (opens new tab). Telephone Number: 020 7919 7171. To see more information on Course Enquiries please click here (opens new tab). Telephone Number: 020 7078 5300. To see more information on Admissions please click here (opens new tab). To see more information on Student Centre please click here (opens new tab). Telephone Number: 020 7919 7050. The Student Centre provides general advice, enrolments, fees, assessments, housing and finance advice. To see more information on Disability and Wellbeing Service please click here (opens new tab). The Disability and Wellbeing Service can help you to arrange any reasonable adjustments, equipment or support you need to study effectively at Goldsmiths. 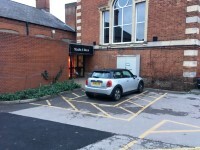 The car park can be used by staff, students and Blue Badge holders. 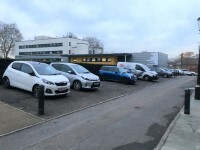 The car park is located at the rear of the Richard Hoggart building. 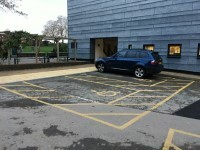 There is/are 3 designated parking bay(s) within the car park. 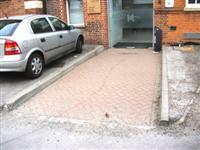 The dimensions of the designated parking bay(s) are 350cm x 500cm (11ft 6in x 16ft 5in). 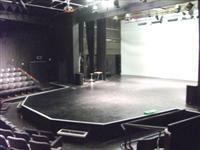 The nearest designated bay is 15m (16yd 1ft) from the Richard Hoggart building Rear Entrance - George Wood Theatre side. 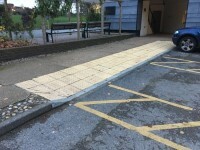 The dropped kerb between the car park and the building does not have tactile paving. 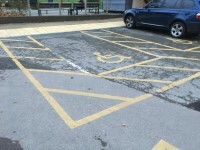 Clearly signed and/or marked on street Blue Badge parking bays are available. 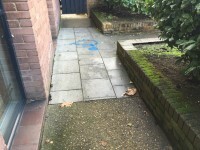 The dimensions of the marked Blue Badge bays are 200cm x 400cm (6ft 7in x 13ft 1in). 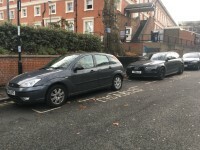 The on street Blue Badge parking bay(s) is/are located on Dixon Road. This information is for the entrance located off College Green. 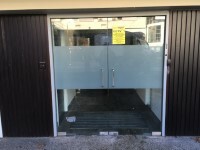 The width of the door opening is 166cm (5ft 5in). There is not level access to the service(s). 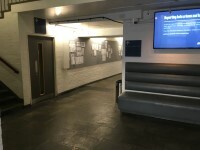 There is level access to the designated seating from the main entrance. 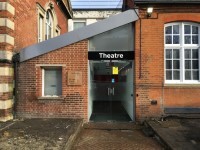 The ramp/slope is located in the corridor past the entrance to the theatre. 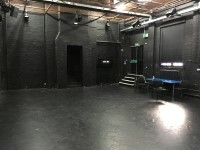 The ramp leads to the step free entrance to the stage, and Recital Room 167. 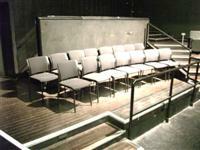 Designated seating is located just inside the theatre. Companions sit beside or behind you. There is not a wheelchair to borrow. This information is for the entrance located off Dixon Road. 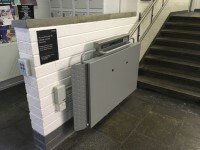 The height of the card reader/lock is 130cm (4ft 3in). 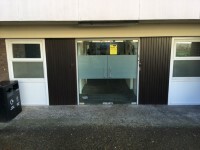 The width of the door opening is 174cm (5ft 9in). 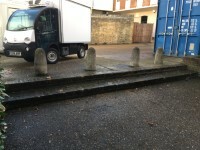 The width of the ramp is 121cm (3ft 12in). 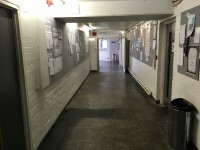 You are on Level Change (Link to the Richard Hoggart Building). Skip to the next section. 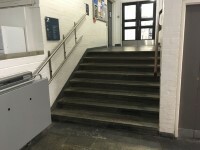 The step(s) is/are located opposite Recital Room 167. There is/are 8 step(s) to the area/service. 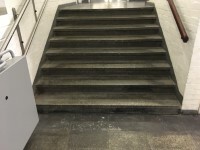 The lighting levels at the step(s) are medium. There is a lift to access this area/service. The lift does bypass the step(s). 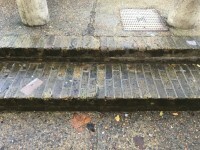 These steps can be overcome by using the rear entrance to the Richard Hoggart Building. Please see the separate guide for the Richard Hoggart Building for more details. 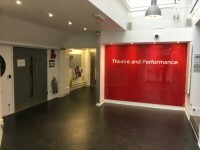 The lift is located opposite Recital Room 167. 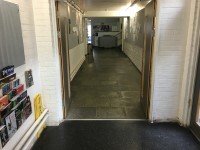 The floors which are accessible by this lift are G, link bridge to Richard Hoggart building. 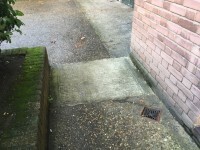 The platform lift accesses a small level change. 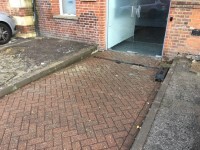 The lift is approximately 15m (16yd 1ft) from the main entrance. 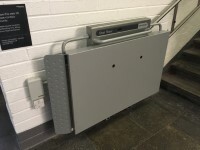 The dimensions of the lift are 80cm x 126cm (2ft 7in x 4ft 2in). 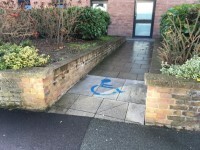 This accessible toilet is approximately 17m (18yd 1ft) from the main entrance. 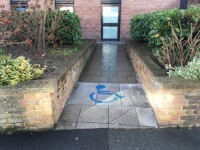 This accessible toilet is located straight ahead on entering through the main entrance at the rear of the building. The width of the accessible toilet door is 89cm (2ft 11in). 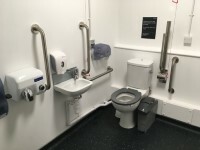 The dimensions of the accessible toilet are 199cm x 209cm (6ft 6in x 6ft 10in). There is not a clear 150cm x 150cm manoeuvring space in the accessible toilet. The lateral transfer space is 133cm (4ft 4in). The height of the coat hook is 166cm from the floor. The height of the toilet seat above floor level is 47cm (1ft 7in). The wash basin is placed higher than 74cm (2ft 5in). The height of the wash basin is 75cm (2ft 6in). The soap dispenser can be reached from seated on the toilet. The height of the soap dispenser is 91cm. The toilet surveyed is located straight ahead on entering through the main entrance at the rear of the building. 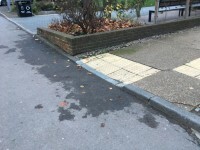 The standard toilet surveyed is approximately 18m from the main entrance. Disability Equality courses are run by Student Services. These are open to all staff but are not compulsory.